Published on October 21, 2016 by Martyn. Be the first to comment! 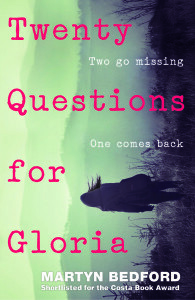 I’m delighted to announce that Twenty Questions for Gloria has been nominated for 2017 Carnegie Medal – the third time I’ve been in contention for this most prestigious of awards in the UK for children’s and teenage fiction. The list of titles was revealed today by CILIP, the Chartered Institute of Library and Information Professionals, which organises the award – now in its 80th year – and whose membership makes the nominations. I’m honoured to be rubbing shoulders with some of the leading YA and children’s authors: Malorie Blackman, Frank Cottrell Boyce, John Boyne, Anne Cassidy, Cressida Cowell, Jenny Downham, Matt Haig, Tanya Landman, Hayley Long, Simon Mayo, Louise O’Neill, Mal Peet, Meg Rosoff, Annabel Pitcher, Chris Priestley, Philip Reeve, Francesca Simon, Rebecca Stead and Nicola Yoon. It’s especially pleasing to see my Creative Writing PhD student Liz Flanagan among the nominations for her debut YA novel, Eden Summer, which I’ve been supervising at Leeds Trinity University, and Crush, by Eve Ainsworth, with whom I share an agent – Stephanie Thwaites, at Curtis Brown – and with whom I shared a stage at the Hay Festival earlier this year. In fact, all four of the authors from that Hay panel are nominated, as Patrice Lawrence (Orangeboy) and Juno Dawson (All of the Above) are also on the Carnegie list. Great to see that my publishers, Walker Books, have five titles in contention. The 114 nominated books will be whittled down to a longlist, published in February, then a shortlist, in March, with the winner being announced in June. The longlisted and shortlisted titles for the Carnegie Medal and its sister prize for books aimed at younger readers, the Kate Greenaway, are shadowed by 100,000 students in 5,000 reading groups at participating schools across the country. Previous Carnegie winners include Terry Pratchett, Neil Gaiman, Philip Pullman, Patrick Ness and C.S. Lewis. To see the full lists of nominations for both awards please click on this link to the Carnegie/Greenaway website.